Just when you thought you’ve seen all there was to see of our 2012 Christmas decorations, I have one last thing I just have to share! When it came time to start putting up our 2012 Christmas decorations, G did his part by bringing all of my Christmas supplies up from the basement – including this scraggly little Christmas tree which he dubbed a “Charlie Brown tree.” I’ve always loved this tree, but even I have to admit it’d seen better days. After a year of being carelessly shoved into a remote corner of our basement (not to mention a couple of falls) it’s branches were all mangled and mashed together, and half of the lights had burned out. It sat in our living room, along with all of our other Christmas decorations and supplies, while I decked our halls (the tree and I both ignoring G when he kept insisting I throw it out) but I never intended to use it this year. Sorry little tree, but you were destined to spend December in that dark corner of the basement again…until Kate claimed you! Kate took one look at this scraggly little tree, plugged it in, gasped in joyous awe, and declared that it was hers. She started raided my bin of ornaments and ribbons and beads, and soon had her precious little tree “decorated” (at her eye level only, of course). 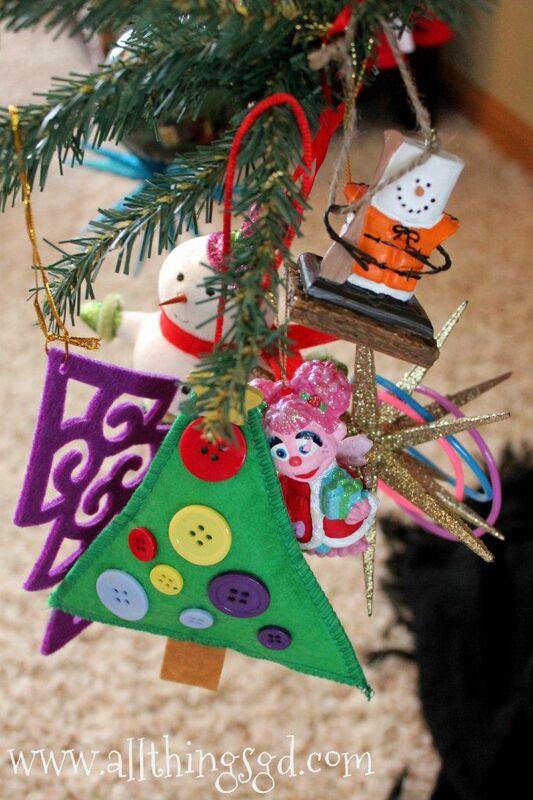 Kate decorated her newly claimed Christmas tree all by herself! I assumed Kate would tire of her little tree in a day or two and then I’d put it back in storage, but boy was I wrong! She took it as a personal insult if she woke up and saw that the lights of our big tree were lit, but her little scraggly tree was not. After a couple of weeks of Kate carefully caretaking her sad little Christmas tree, I admitted it was here to stay, so I cleaned it up a bit, straightening all its branches, and replacing its lights. Kate was more than eager to once again decorate her precious tree, this time with G’s help to reach some of the upper branches. 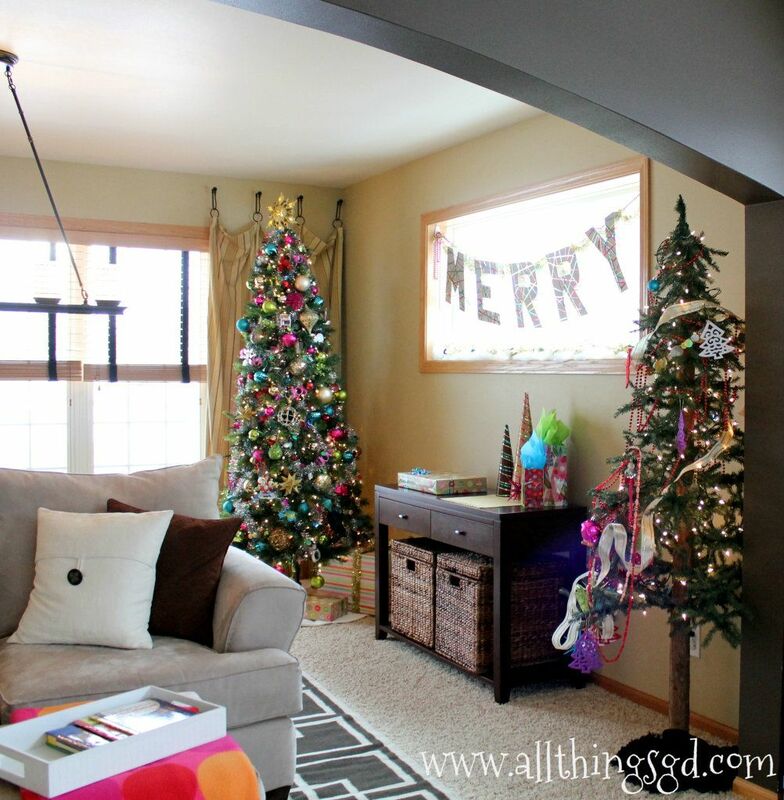 Kate’s little Christmas tree is now the perfect addition to our family room! 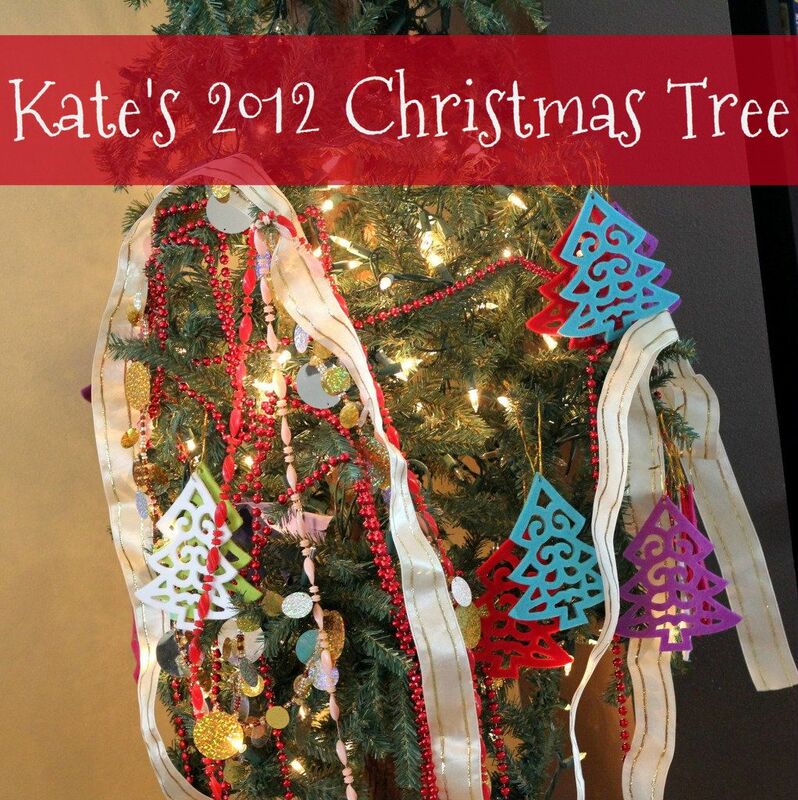 Since then, the decorations on Kate’s tree change almost by the minute. She started by raiding my ornaments and ribbons bins and plucking her favorites off our big Christmas tree. Then of course (in true Kate fashion) she took creativity to a whole ‘nother level by adding even more decorations to her tree include necklaces and bracelets, crumpled up pieces of colorful construction paper, and even my wine glass charms which she snagged from a drawer in the kitchen! Kate loves receiving Christmas cards almost as much as she loves her little tree, so it was only fitting that she eventually added those to her tree, too! 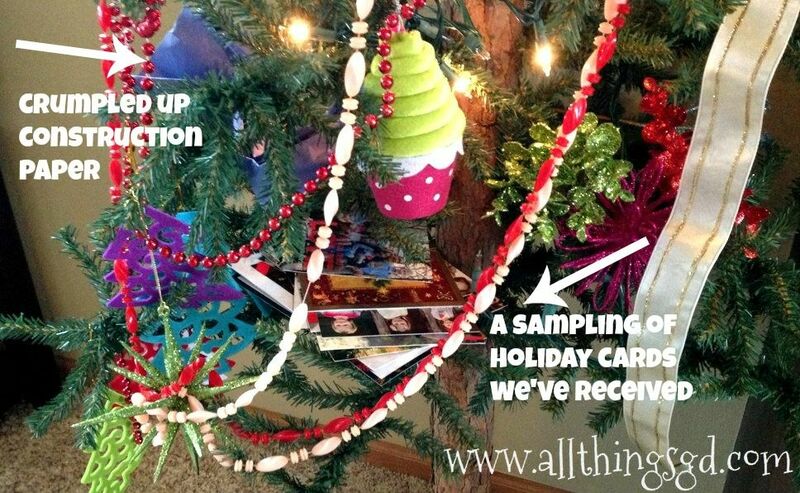 Kate has taken to hoarding her favorite things in her tree like a little birdie in its nest! Kate likes loading multiple ornaments onto the same branch so they don’t get lonely. 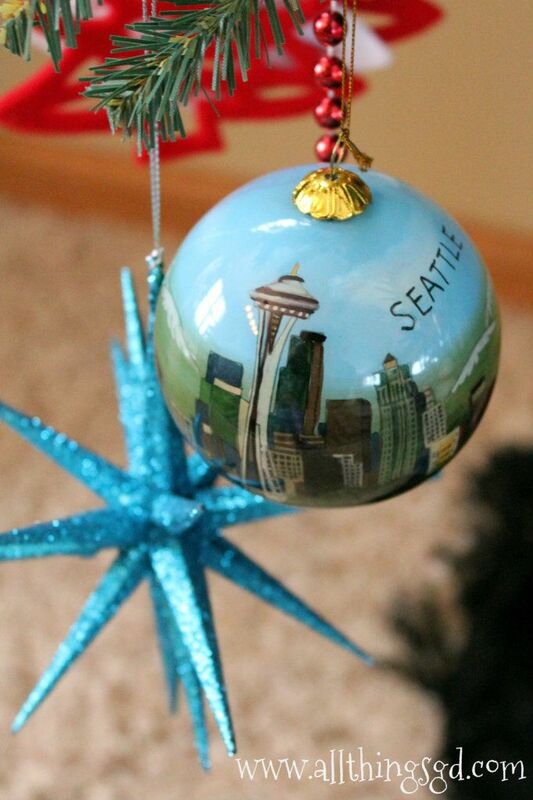 Kate’s newest ornament is this beautiful hand-painted Seattle ornament from her Aunt Lesley and Uncle Ben! Kate’s creative Christmas tree has me smiling whenever I walk in the room. 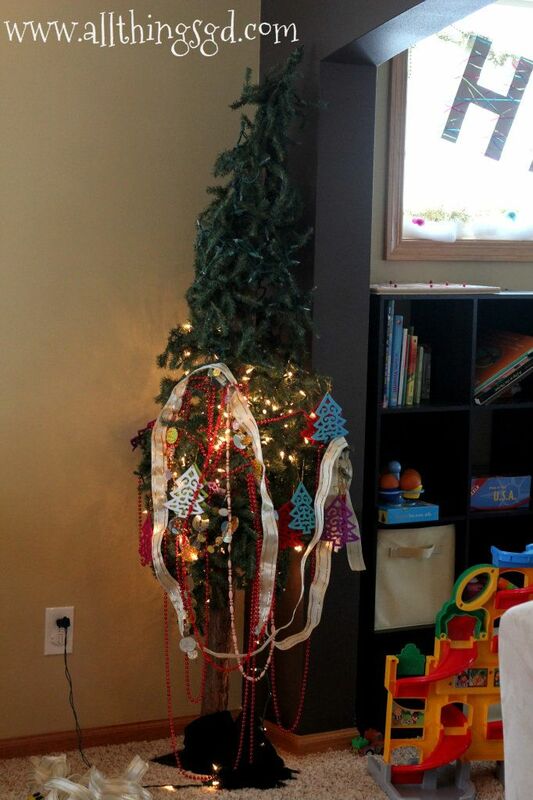 Kate’s little Christmas tree is the perfect addition to our holiday home – I can’t imagine our space without it! Kate, decorating her beloved Christmas tree (click to enlarge). 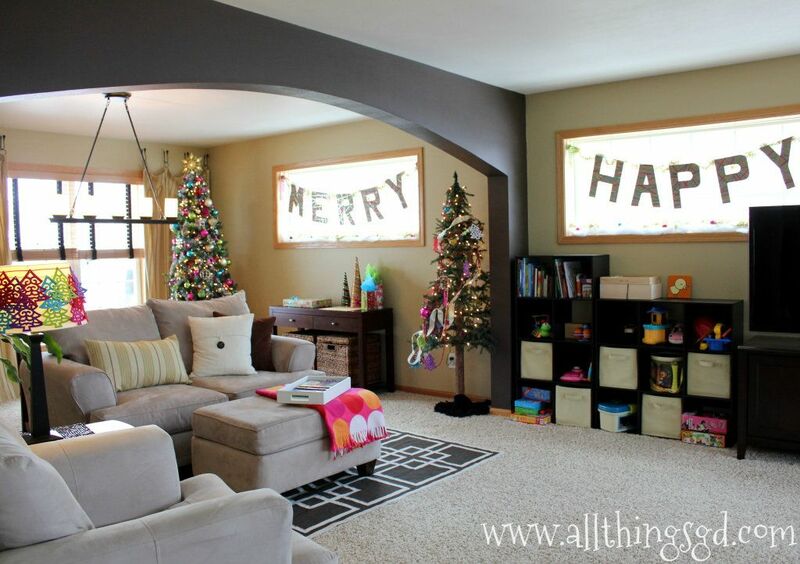 I hope your home is filled with as much cheer as our is on this beautiful day! Merry Christmas and Happy Holidays everyone! Hello! I recently found your blog (again, it’s been awhile for an unknown reason) and loved this post. I have a 3 year old daughter and I fell in love with a pink and silver glitter tree at a local candy shop and brought it home for her before she knew what it was. This year, all 3 1/2 years of her, loved that tree like no other. 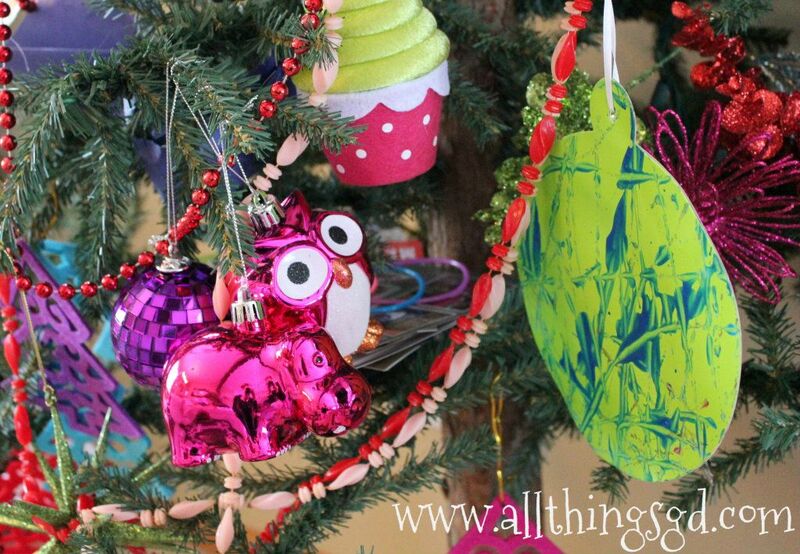 We picked out new ornaments (including the same hippos, we have an obsession in my house so we bought all the colors) and so many more ornaments. She’s so in love I don’t have the heart to take it down and it’s January 12. I hate to have to break it to her that it’ll need to come down tomorrow. Love your blog and I’m already checking out the rest of it!